Water is our most precious resource. It covers 70% of the Earth’s surface and every living organism is dependent upon it for survival. Less than 30% of people on this planet even have access to safe drinking water – a basic human right. In the coming years, we will likely see that access to clean, safe water will become even more important than the climate change. In fact here in the US, 36 states anticipate local, regional and even statewide water shortages by 2013. We can all take immediate steps starting in our own households to more efficiently use water so there is enough to go around. The US EPA estimates that an average family of 4 in the US consumes around 400 gallons of water a day, 280 of which are used indoors. At least 20-30% of that water usage can be reduced with a few simple acts and upgrades. Here are 10 easy ways to save water in your household, starting from very simple and free to slightly more involved with an investment. Save Water For Another Use – Keep a pitcher on hand near the sink or shower to catch extra water for another use. When you’re waiting for the water to get hot or cold, put the pitcher under the faucet and a bucket under the showerhead. Use that water for your plants, to wash fruit and vegetables, for your pet, or for cleaning. It may seem excessive, but in reality, every drop counts. Be Water Conscious – Just like you think about saving energy by turning off your lights, switching off the power strip and charging your phone with your Solio, you should be just as conscious about conserving water. Turn off the water while brushing your teeth or shaving, use less water when hand washing dishes, don’t use hot water to defrost food, and take shorter showers. We all know these things and mean to do them, but sometimes we forget. So program it into your daily routine to be conscious about water use. Stop and Fix Leaks – Leaks are a huge waste of water and there really is no excuse for letting them go unfixed.Whether it is a faucet, your shower or your toilet, take action today to stop the leak. Sometimes it is as simple as tightening a knob with a wrench, other times you may need to bring in a professional. A toilet that is running constantly could be leaking up to 200 gallons a day! To check your toilet for leaks, utilize a simple dye test, and install a new flapper if you find a leak. Not only will you save water by fixing your leaks, but you’ll also be saving money on your water bill. Wash Full Loads – Use your appliances efficiently by washing only full loads of dishes or clothes. Wait the extra meal to have enough dishes or another day until you have enough clothes to make running that appliance worth it. While some appliances have settings for smaller loads, most do not, and use just as much water to wash a few things as it does to wash a full load. Compost – Rather than shove your waste food down the garbage disposal throw all those lovely scraps into your composter. When you use a garbage disposal the faucet is running for that full length of time, not to mention garbage disposals can add 50% to the volume of solids in the sewer system. Composting will provide you with ample, rich soil and save you water as well. Install Low-Flow Fixtures – Low-flow faucet aerators and showerheads are reasonably priced and can affect huge water savings. Look forWaterSense labeled products that use 20% or more less water than other fixtures. Most new fixtures are modestly priced and can be installed without the aid of a professional. Trade Out Your Toilet – Since toilets are responsible for 27% of indoor household water use, it’s worth looking into replacing yours. If your toilet was made before 1993 it likely uses 3.5 gallons per flush. Newer and more water efficient toilets use 1.6 gallons per flush or less. WaterSense labeled toilets will let you know which ones use less water. Look for dual flush toilets that let you choose the right amount of water necessary to flush. If your budget doesn’t quite allow for a new toilet, use a water displacement device in the tank, like a plastic bottle filled with sand and water. Replace Your Appliances – The most water efficient dishwashers and clothes washers are also Energy Star labeled, which also means reduced energy use. While buying a new appliance isn’t cheap, you will get a return on your investment just through energy savings alone and save a lot of water. Also, be sure to read your appliance manuals thoroughly to understand the various settings, and energy saving cycles to efficiently wash your dishes or clothes. Install a Rainwater Catchment or Greywater System – A rainwater catchment system or a greywater system will use non-potable water to flush toilets or water your plants. Both systems make use of water that would otherwise go to waste in your house. For new constructions, rainwater or greywater systems are very easy to integrate into your home. Install an On Demand Hot Water Heater – Rather than wait for the hot water to reach your shower or sink, install a tankless, on demand hot water heater. This way you reduce cold water wasted down the drain and save 24-34% energy compared to traditional hot water heaters. Wow, you fixed my clogs for $70 and no service call. You are my go to plumber from now on. The plumber from 2020 Plumbing was so courteous, clean and fast. Thank you again for our new efficient water heater! 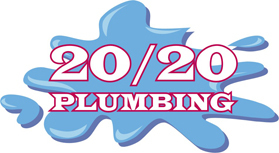 2020 Plumbing fixed our running toilet and leaky faucets in under one hour. What a savings and job well done! We replaced all our toilets and shower heads with new low flow models. What a savings! Thanks again Shane!